A fairly typical morning routine for me. The great thing about Asian skincare is how customizable it is. Your routine can be as elaborate or as simple as you want it; it can target one specific issue or a number of them all at once. You can stick to a limited budget or go all-out. The only limits are the ones you set. With that being said, there’s a lot of room for error on the road to your perfect routine. That’s why I wrote this guide. I hope it helps you make some sense of the bewildering array of choices ahead of you! So what’s the first step in building an Asian skincare routine? It’s knowing what changes you want to see in your skin. Much like changing your diet or genetically engineering a new dinosaur species, developing a new skincare routine is first and foremost about solving a problem (or problems). Determine what skin issues you want to target. Do you have problems with acne? Dryness? Aging? Pigmentation? Your unique combination of concerns–and your sensitivities, if you know them–should drive your product selection. Keep track of the products you’ve used and their results (or lack thereof) so that you can get to know your skin better. 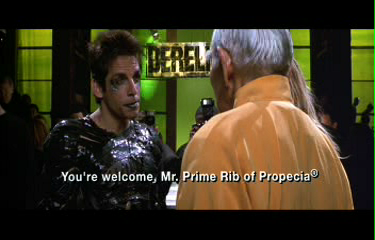 Once you’ve identified your goal(s), be like Zoolander at Derelicte. Pay no attention to the beautiful products that aren’t targeted for your skin concerns. Keep your eyes on the Prime Rib of Propecia, who allegorically (or metaphorically, or symbolically, I forget, bad English major! Bad! Bad!) represents your best skin. One final note before we get down to business: Never introduce a whole bunch of products to your routine at once. Doing so means that if one of your new products doesn’t agree with your skin, you’ll have no idea which one it is. Add new products one at a time, and use them for at least a week or two before moving on to the next in order to give your skin time to react to anything it doesn’t like in the formulation. When transitioning to an Asian-style skincare routine, I strongly believe it’s ideal to start with sunscreen. There are a couple of reasons why. One, sunscreen is literally the most important anti-aging product you can put on your face. No other anti-aging lotion or potion will do a thing for you if you don’t protect your face from UV radiation. And two, despite the importance of sunscreen, it is ridiculously difficult to find an affordable, accessible, and usable face sunscreen on the shelves of American drugstores. (Kiss my A-Sol, Neutrogena Ultra “Sheer” “Dry” Touch Sunscreen. You are made of stark white grease and lies.) So start, if you can, by grabbing a few Japanese sunscreens to try, ideally ones with the maximum protection of SPF 50+ and PA++++. I get nervous when I’m down to just one backup, so I always keep multiples on hand. 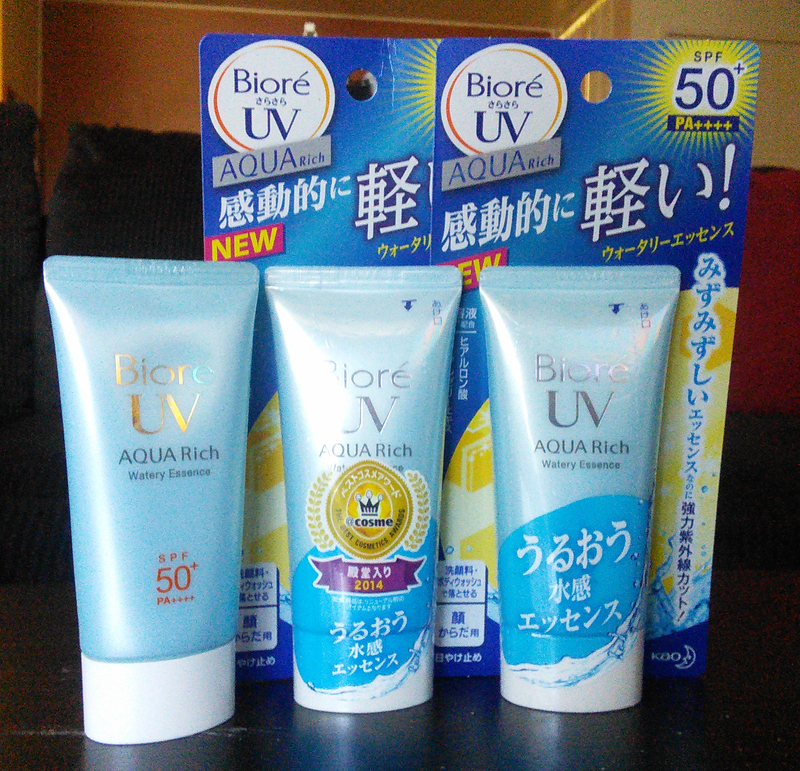 The sunscreen I use every day is Biore UV Aqua Rich Watery Essence SPF 50+ PA++++. It’s great for me, because my skin leans normal/balanced and the multiple hydrating layers and final moisturizing step in my morning routine keep the somewhat alcohol-heavy product from drying out my skin. But there’s no such thing as a universally perfect product! Many people with dry or dehydrated complexions shrivel up on contact with the Biore Watery Essence. If you’re one of those, you may want to start your search with a different sunscreen. I found Shiseido Senka Aging Care Sunscreen SPF 50+ PA++++ to be incredibly moisturizing, but with the same clear finish (no white cast!) as the Biore. Oil cleansing is the exception to the “introduce one new product at a time and wait at least a week before adding the next” rule. In fact, I’d suggest buying your first oil cleanser at the same time as your sunscreen. This is because when you wear sunscreen, you need a way to properly remove it at night. Habitually neglecting the nighttime cleanse can clog pores and lead to breakouts. On top of that, none of the other products you might add later on will deliver their full effects unless you’re applying them to a nice clean face. And many foaming cleansers don’t actually remove makeup and sunscreen well. Sunscreen is particularly stubborn. Many sunscreens are specifically formulated to adhere to your skin like a Secret Service agent to the President. Luckily, hunting down a good emulsifying cleansing oil or balm isn’t usually as much of a challenge as finding a good sunscreen. Just grab a bunch of samples or jump right into a full size of whatever strikes your fancy. I prefer cleansing sherbets, which feel luxurious and deliver all the makeup-dissolving power of cleansing oils without any of the drippy mess. I used Banila Co. Clean It Zero for months, and I would have posted a positive review of it already if Kerry at Skin and Tonics hadn’t already given the definitive Clean It Zero rave review. You’ll find oil cleansing options at every price point and that fit just about every aesthetic. And if you want to stick with the local drugstore for this cleansing step, a few Western brands make cleansing oils now. Garnier’s cleansing oil was my first. Cold cream will also work for the sunscreen/makeup removal step of your double cleanse. Do you really need to replace your foaming cleanser? It depends on two factors. Okay, it depends on three, but the third factor is whether you care about optimizing your routine. For the purposes of this guide, I’m just assuming that you do. The first factor to evaluate is whether your cleanser makes your skin feel dry, tight, or in any way uncomfortable after you wash your face. If it does, then it’s time to seek out a cleanser that won’t strip your skin of all its necessary lipids. The second factor is the actual pH of your cleanser, which you can sometimes find out by Googling, other times by emailing the manufacturer (and I personally think that if they won’t tell you, that’s just unbearably shady), or by getting a cheap pack of litmus strips and testing it out yourself. Is it higher than 5.5 or 6? If so, get off this path of harsh cleansing and sadly diminished moisture barriers and pick something milder. If it’s 9 or above, let me know so that I can buy a Mass for your poor acid mantle. Unfortunately, most cleansers today are still formulated at quite a high pH. Even COSRX hasn’t come out with a gentle, low-pH cleanser (yet). 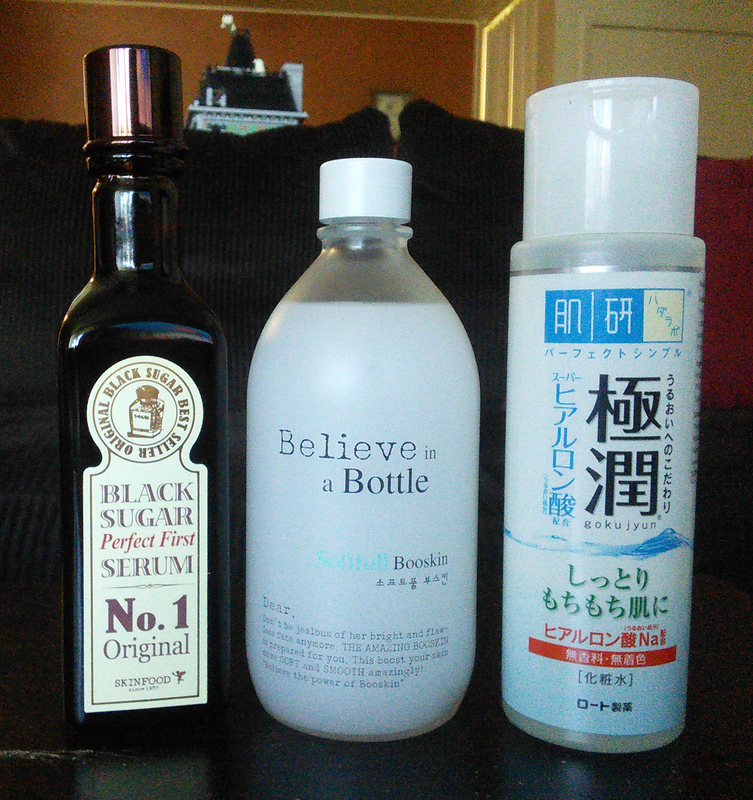 There aren’t all that many mild, low-pH foaming cleansers in the Asian skincare market, but there are some, and the ones I’ve tried are nice. If you’re feeling fancy, Missha’s Super Aqua Oxygen Micro Visible Deep Cleanser is pretty enjoyable. These days, though, I primarily use the blander and more economical Hada Labo Gokujyun Hyaluronic Acid Cleansing Foam. If your skin is too sensitive to handle even a mild foaming cleanser, look into milk cleansers instead. If you don’t feel the need to go the Asian route for a mere face wash, CeraVe Foaming Facial Cleanser is at an appropriate pH. I’ve used it. It’s fine. Neutrogena’s Ultra Gentle Daily Cleanser in the foaming variety is okay, too. I hope you’re still with me, because the best is yet to come. I know cleansing and double cleansing are boring and tedious. That’s why I spice mine up with a variety of “cute” headbands. I may start collecting K-brands’ logo headbands, actually. Steps 4 – Infinity: Treatment products! Okay, you’ve got the boring, basic, hygiene-oriented steps out of the way. What’s next? Now it’s time to tackle the infinite variety of treatment, hydration, and moisturization steps that the Asian skincare industry has to offer. Below, I’ll talk about acids, toners, first essences, essences, serums, ampoules, and creams: the meat of the famously customizable Asian skincare routine. I’m presenting them in the order in which you’d use them in your routine, more or less, but from this point on, there’s no universal reason to add these steps into your routine in any particular order. Listen to your skin and follow your gut. If your primary concern is moisturization (as in, dry skin that gets too little, or oily skin that always seems to get too much), you may want to skip ahead to creams before deciding whether you need anything else. If you want to tackle textural or pigmentation issues caused by aging, acne, or UV damage, on the other hand, maybe check out heavy hitters like acids or serums and ampoules first. Do what you want. Don’t feel obligated to have one of each type, and don’t feel limited to just one of each type. There are no rules. It’s all about your needs. Go wild! But one product at a time, obviously. Feel free to skip acids if none of the above are concerns. Due to the recommended wait times after application of each acid product and to the photosensitizing nature of some acids (AHAs), they can be more trouble than they’re worth if you don’t feel you need them. I’m really not foreseeing any way that COSRX won’t be making my AHA and BHA of choice for some time to come. If, on the other hand, you decide that you do need some acids in your routine, be discriminating. Just because a product says “AHA,” “BHA,” or “Vitamin C” on the label doesn’t mean it’s formulated effectively. You probably know that I love COSRX AHA 7 Whitehead Power Liquid and COSRX BHA Blackhead Power Liquid, but there are a few other options you could try. Mizon AHA 8% Peeling Serum is well known, and Wishtrend-exclusive (I think) brand Chica y Chico makes a BHA cream, Beta Salic 2.0. As far as L-ascorbic acid vitamin C goes, the C20 and C21.5 vitamin C serums (made by a sister company to COSRX, how about that!) are among the most famous. I like both. 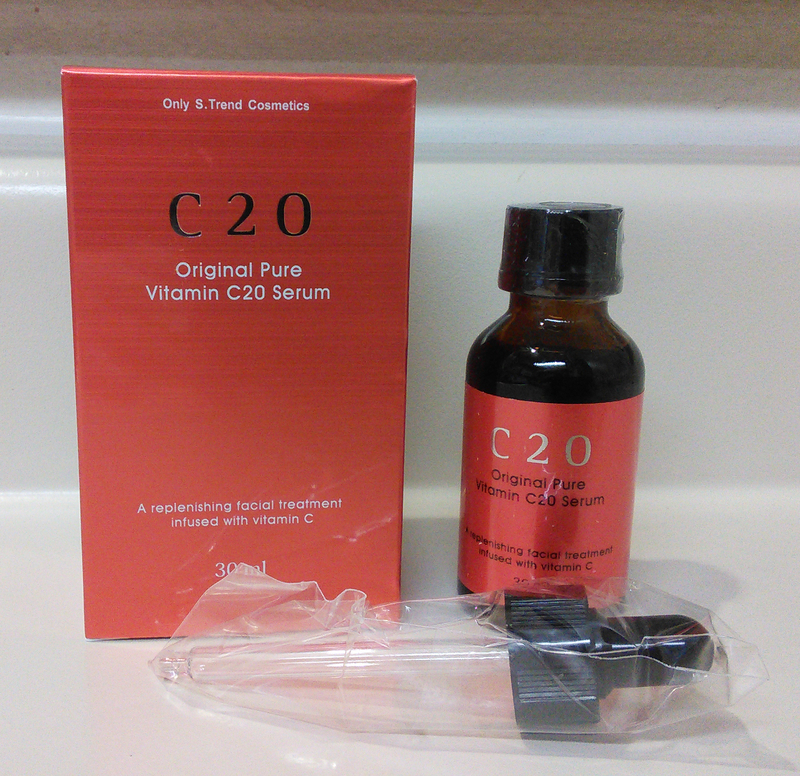 Formulated with 20% L-AA, C20 contains more stabilizing and anti-aging ingredients, but also has alcohol and may feel a bit sticky on the skin, while C21.5 is watery, totally non-sticky, alcohol-free, and 21.5% vitamin C, but lacks the stabilizers and additional anti-agers. There may be other vitamin C serums that I haven’t heard of, too. I was in love with C20 after a week of use. It’s just that good. Once you’ve chosen your acids, take your time introducing them to your skin. Overexfoliation is unpretty and uncomfortable, and it takes a lot of time and a lot of babying to repair the moisture barrier damage that it can cause. Add one acid at a time and gradually work up from once-every-third-day use to once-daily use. Reduce usage if you notice any irritation or discomfort. Take time to learn and build your skin’s tolerance. You’re making progress, and so is your skin! Now it’s time to turn to arguably the most skincaretaining part of the Asian beauty routine: toners, first essences, regular essences, serums, and ampoules! Below, I’ll explain the main points about each step. The rest is up to you. Start with one thing that you think will be most helpful, use it for a while, gauge the results, and decide after that whether you need more (and then more, and more, and more!). Most Asian toners are nothing like your bracingly astringent Sea Breeze memories. Asian toners aren’t meant to dry up the last drop of oil or moisture on your skin and force it into a state of cowed submission (that always backfires later on). Instead, they’re meant to soften your skin and prepare it appropriately to receive the full benefits of whatever skincare products you apply afterwards. There are two major classes of Asian toner. When applied with a cotton pad, both types can be used to remove any residue remaining after cleansing or exfoliation, but that’s not their primary function, and they can be sprayed or patted on with hands instead. pH-adjusting toners, like COSRX AHA/BHA Clarifying Treatment Toner and Mizon AHA BHA Daily Clean Toner, are formulated to bring the skin’s pH back down to an acidic state after cleansing so that acids can do more during their brief window of effectiveness. Since I already use a low-pH cleanser, I don’t feel the need for a pH-adjusting toner, but they can be very useful if you’re still using a high-pH cleanser for some reason. “Believe in a Bottle”? Yeah, I’m starting to believe. Hydrating/prepping toners, like my Dear by Enprani Softfull Booskin, Skinfood Black Sugar Perfect First Serum, and Hada Labo Gokujyun Super Hyaluronic Acid Lotion (which, honestly, I think of as more of an essence due to its texture) are meant to lightly hydrate skin and make it optimally receptive for any non-acid treatment steps that follow. They may also contain moderate amounts of actives to treat specific skin issues. The Skinfood, for example, contains several melanin-inhibitory ingredients to help brighten skin. The more neutral pH and inclusion of nourishing ingredients in these toners make them unsuitable for use before acids. I personally didn’t use toners until recently. Since they tend to have the lowest concentration of actives and beneficial ingredients out of all the Asian skincare treatment steps, they never interested me much. I’m appreciating their lightness and absorption-speeding capabilities now that it’s summer and I can’t stand feeling anything heavy or sticky on my face, though. First essences are a special and very specific category. Like toners, they’re watery products that soften skin and help other products sink in better. Unlike a run-of-the-mill toner, however, first essences are characterized by a high amount of some kind of ferment extract or filtrate, usually yeast (galactomyces or saccharomyces, typically) and the inclusion of niacinamide and other melanin-inhibiting agents. The melanin-inhibiting ingredients help brighten and even out skin tone, while the ferments supposedly preserve suppleness and delay wrinkles by moisturizing and delivering antioxidants to the skin. Missha Time Revolution The First Treatment Essence is a first essence, as you might have guessed. So is the famous SK-II Facial Treatment Essence and, less obviously, COSRX Galactomyces 95 Brightening Power Essence. These days, I don’t really have a strong feeling one way or the other about first essences. If you’re intrigued by the ferment concept and prioritize getting an even glow, then they may be worth looking into, but they’re by no means a necessity. Should you want to check out the first essence scene, many of the major brands make them, and lots of the lesser known ones do, too. In terms of real skin benefits, regular essences, like my Tosowoong Propolis Natural Pure Essence and the controversial Benton Snail Bee High Content Essence, are a step up from toners and first essences. While still quite hydrating and fast-absorbing, regular essences tend to be a bit thicker, ranging from a viscous liquid (one of my favorites of this type is A.True Real Black Tea True Active Essence) to a light gel texture. They usually deliver a higher dose of actives, antioxidants, and other helpful ingredients to skin. Because essences still aren’t as intensive as serums and ampoules, I didn’t pay much attention to them until recently, either. Summer changed my mind just like it did about toners. When I’m already uncomfortably hot and sweaty, the last thing I want to feel on my face is layer after layer of heavy serum. There’s a reason we don’t wear wool turtlenecks in June. Essences are like the cotton T-shirts of Asian skincare. My point is that as you consider essences and other treatment steps, take weather and comfort into account alongside your skincare goals. You can (and probably will) change your lineup quite a bit as time passes and you develop ingredient awareness, so go with what will be most usable now. Technically, serums and ampoules are two different things. Serums are thicker and more viscous than essences and generally offer a higher concentration of actives, while ampoules are even more concentrated and often meant to be mixed in small amounts with other skincare steps, like my Leejiham Vita Propolis Ampoule. But the terms are so often used interchangeably that I just treat them interchangeably. A good serum/ampoule product is often a critical step in an effective skincare routine, and every Asian skincare company ever offers a wide variety of such products for customers to pick and choose from. My preciouses, every single one. Though I’m glad I’ve chosen to stick to light-textured products like Mizon Placenta 45 Ampoule and Shara Shara Honey Bomb All In One Ampoule in my morning routine, I do still want the additional moisture and nourishment that the thicker Banila Co. Miss Flower & Mr. Honey Amazing Wonderful Heavenly Essence Oil provides, so I use that at night, when it’s cooler and I don’t mind being a bit layered up. 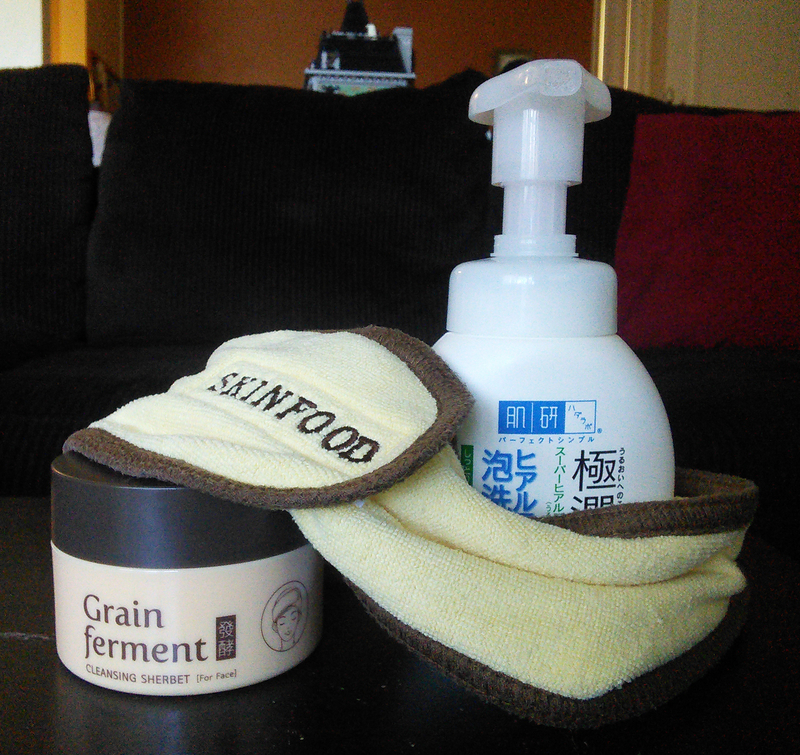 Finally, we come to the last stage of the lengthy and wonderful Asian skincare routine. Emulsions and creams will probably be the most familiar product types to Asian skincare novices, since they’re pretty much classical moisturizers. Their primary functions are to add some more hydration to the skin and to lock it in with occlusive ingredients, preventing Trans-Epidermal Water Loss (TEWL). Emulsions are thinner. In texture, they can resemble either a typical Western lotion, or a richer but still runny Asian essence. In general, they’re a lighter moisturizing step than creams and targeted at normal-to-oily complexions. In practice, however, let’s just say I’ve met a few emulsions, like Laneige White Plus Renew Emulsion, that actually made me oilier than most creams. Creams will be thicker but aren’t always creamy. Sometimes they’re quite watery, more hydrating than occlusive, silicone-based instead of oil-based, and known as gel creams. Others, like Mizon Returning Starfish Cream, are delightfully weird and indescribable. I prefer creams to emulsions because they seal things in better. People with very dry skin may choose to layer both! Some emulsions and creams also deliver actives like niacinamide and adenosine. For me, ingredients like these are just a bonus, as the rest of my routine already contains the actives I want in several steps. If you’re planning a shorter, more streamlined routine, however, you may want to pay close attention to them so that you can get the most skincare bang for your buck. And that’s it–the fundamental steps of the Asian skincare routine (okay, the acids are really more of a Western thing, but they are catching on) laid out to make your journey to your own ideal routine easier. If you’re still with me, I applaud your dedication. I’m sure you’ll be rewarded! Yeah okay, you freak. But how am I supposed to TRY all this stuff to figure out what I really need? Oh yeah. Actually trying stuff out. If you don’t live in a pretty diverse area with a well established Asian community, it might seem like getting your hands on enough different products to try would be impossible. And how are you supposed to afford full sizes of a whole bunch of different things that might all turn out to be losers? Samples are a huge thing, and they’re remarkably easy to get online. Sites like RoseRoseShop and TesterKorea sell them, often in packs of ten. Innisfree sells big, recloseable sample sizes of many of their popular items, and just about every brand out there offers trial sizes and travel kits. Online shops like Jolse (especially Jolse) hand samples out so generously that you’ll end up building a sizable sample stash after just a few orders. Hell, I found a 25-pack of samples of the incredible Su:m37 White Award Bubble Detox Mask on Amazon. What I’m saying is that once you find your feet in the Asian skincare landscape, you’ll be in a position to try just about anything, no matter how far you are from the nearest Koreatown. How far along are you in building an Asian skincare routine? Tell me what you’ve got going on in the comments! Hi,I love reading your blog. I need help. I have started using Korean skincare products but have no clue what I am doing. My skin suddenly just goes bananas,so I have stopped with everything! My skin became more sensitive and dry patches and strange looking breakouts!what am I doing wrong?These are the products I bought. Lee Jiham Vita propolis Ampoule +the cream,TFTE Missha,Hada labo HA toner,Blithe Vital treatment 8 nourishing Beans,Pyunkang Yul Essence toner,Su:m37 miracle rose cleansing stick Lotion P50W from Biologique Recherche and Rosehip seed oil. Please help. are you normal using botanicals? (pyunkang yul as well as the rose cleansing stick) could freak out sensitive skin. also i have looked up the blith vital treatment 8 nourishing beans and it oes have some ingredients that are comenegenic which can break out skin. Also do you have any allergies in regards to seasonal changes? the it could be the propolis ampoule. or maybe you overeksfoliated your skin with the p50w – that can sensitize skin a lot. now i am no profesional but the hada labo and the rosehip seed oil should be quiet gentle so if you planned on reintroducing products start with one of them and wait a week before introducing the next product. Ahh, alright. Should i use the vit c serum after my essence (im curently using cosrx snail mucin essence) or right after my aha/bha toner? Thankyou so much! I have wishtrend’s Vit C serum and I love it for resolving my dark spots. Im considering using COSRX’s AHA/BHA clarifying treatment toner bevause of closed comedones galore. Am i able to use them both at the same routine time?how long should i wait in between before putting on my next product? or should I use them on alternate nights? I only use my vit c serum at night and i fear of over exfoliating…help please! I ahve super oily skin with larged pores..now i just started use korean skincare..but im not sure why my skinn look dull n became more oily during day n night time..my pores still d same..my face now redness, few pimples..
Can u tell me y it happen..my night rutin evryday ive clense, tone, elianto HA, c20 serum n 9 to 5 crema..
my day rutine cleanse, tone, elianto HA, klairs moist sooting serum n im from vitamin tree gell n foundation..
Is my step wrong..for your info..bfore this ive stop from using our local product that they claimed have hydroquinon..
Are these routine in order? So i use acid first and then apply toner? That’s right! I consider exfoliants and actives to be an extension of the cleansing step, and then hydrating steps go after that. where in the skincare routine do exfoliators fall? after cleansing and before actives? or do exfoliators ruin the ph conditions needed by the actives? also can pyungakyul essence toner be considered a first essence? Do you mean AHA/BHA chemical exfoliators? I put those right after cleansing and before any hydrating steps (toner, serum etc.) Chemical exfoliators are actives. sorry, i meant the cosrx pimple/original pads and the neogen bio peel gauze pads. i know the former is a chemical exfoliator so its an active but does it go before AHA/BHA or after? and what about the neogen pads? theyre a physical exfoliant so where do they go in the routine? I have major breakouts twice within 4 years both when i started to try korean skincare. My skin is oily/combination and acne-prone. The first time was when i used innisfree green tea cleansing oil and the face shop rice water bright cleanser and the second one was when i use klairs rich noist foaming cleanser. Can u suggest any brand for me to try to gain back my trust in korean skincare? And thank you for the info, i just know that the actives go before toner. Silly me. 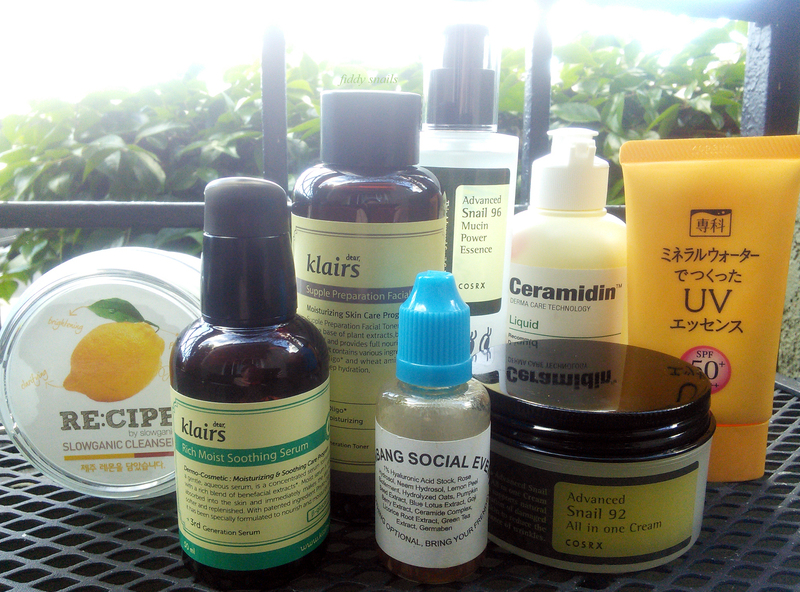 Your first problen was the fact that you used the klairs foaming cleanser on your oily skin. The cleanser is only meant for dry skin, as it’s sole purpose is to moisturize. Cosrxs low ph cleanser is really good and shu uemera porefinist cleansing oil has salicylic acid in it which really helps with acne and oily skin. Be sure to look at the ingredients before you buy. Go on “cosdna” and look up the products and they’ll tell you the ratings on how comedonic the ingredients are! I wouldn’t use your AHA/BHA on your exfoliating days. If you want to incorporate both AHA/BHA and exfoliating on the same day, I would do the AHA/BHA in the AM after cleansing and then the rest of your routine (make sure to apply SPF and apply more throughout the day if you are outside a lot.) Then do your exfoliating in the PM that but no AHA/BHA. Hi! im trying to get my skincare routine under control but have some questions…i have oily/acne skin which flares up badly with my cycle, with most of my acne on my cheeks and jawline. I’ve been using a 2 step cleansing routine (do you know much about B.Lab’s i am sorry just cleansing foam? i cant find info on the pH anywhere), then the cosrx bha blackhead power liquid every 2-3 days before bed. after that i use fresh aloe vera combined with some jacaranda essential oil and bentons snail bee steam cream after it is dry (i find this to be too heavy for my already oily skin, especially in the Australian heat right now). I want to start using the cosrx aha whitehead liquid as well as the cosrx snail mucin power essence. will this essence have enough moisturizing properties in it or should i use another light cream afterwards like the advanced snail 92 all in one cream as well/instead of? also how should i start to incorporate the aha into my routine? i already have a great daily sunscreen but im still wondering what step in my routine to use it in and how to make it work with the bha already. I don’t know that much about the B.Lab cleanser, sorry! For your skin type, I think replacing the Benton steam cream with Cosrx snail cream would probably work better–that steam cream is indeed on the heavy side while the Cosrx is much lighter. You can just use the snail cream instead of the essence if you like, since it will give almost as much snail with some added occlusive effect. For AHA, for now I would try it on the days that you aren’t using Cosrx BHA. Do it right after cleansing! Suggest me a routine I could follow. .as I have tried all remedies n still it’s worse..
Hi, what is your current skincare routine? I just stumbled across your blog after going down a rabbit hole while researching I don’t KNOW what anymore! Thank you for all you do. I love how you communicate and see information. Those are the basic building blocks for sure! After that, I would suggest finding a moisturizer that fits your skin’s moisture needs and then going to hydrating toner etc. Only if your skin needs them though! Hi! Thank you for this article, I think we ALL needed it haha. I was wondering if you could recommend some good products that help diminish closed comedones/tiny bumps on my forehead for dry skin? Thank you!! 1) how often in the week should I use them, both AHA and BHA? Should they both be used on different days of the week? 2) is it better to incorporate these in the mornings or at night? Frequency will depend on your skin, but to start with, I’d suggest using them just a few times a week each (maybe alternate nights), and I prefer using them at night to save time in the morning. Is double cleansing really necessary? I was thinking of testing the Sulwhasoo cleansing foam you’ve recommended in other articles. Is that not enough to remove sunscreen/makeup? You don’t mention any eye-specific steps. Do you use eye serums or just rely on your other face products around the eye? Hi! Yes, I do consider double cleansing necessary if you wear sunscreen and makeup, especially because I prefer gentler and barrier-friendly foaming cleansers. I imagine the much harsher foaming cleansers could do the job, but at the expense of your skin barrier and overall moisture levels, while double cleansing can get your skin clean without compromising it. I do use eye stuff, but generally speaking, I don’t think they’re as priority as regular face products, most of which can go around the eyes just fine as long as they don’t bother your eyes due to strong fragrance etc. The only things I’d avoid putting right up in your eye area are AHAs and BHAs. Thanks for this post. Dunno how I got to your site but happy I did. Extensive & extremely helpful. Was wondering if you’ve already come across any products under DECIEM (The Ordinary, NIOD, Hyalamide, to name a few). If yes, do share your thoughts on them pls. Perhaps a blog dedicated to it. Their products seems to be getting a lot of raves since last year. Hi! Thank you so much for making this post, it has helped me so much! ❤️ What products are used, what is the order, in the morning? And what is it at night? Hi! I just found this blog after my sister told me about it and I was hoping for some guidance. I’m seventeen, and from what I can tell I have dry skin. Very dry around my nose more than anywhere else. I have noticeable pores on my cheeks and blackheads on the old nose. I’ve been using Cetaphil products for at night washing and rosewater spray as a toner of sorts. I found beautytap and they have a dry skin subscription box to try but I wasnt sure. An affordable route to go for good skincare. Thank you! I’ve been pouring over your blog for hours (days!). I have just ordered from Curology and A’pieu Natural Sun Cream from your links. Thanks! I also just litmus tested my facial soap. I’ve been using goat’s milk bar soap for a few weeks. It came back as a Ph of 8!!! No wonder I’ve been having skin issues. Thankfully, I have another cleanser on hand that tested at a Ph of 5, and believe it or not, it’s actually Dial body wash (cue shocked face :-0). I’ve been using May Coop Raw Sauce for a while and love it. I’m ready and excited to continue on my AB journey and stock up on lots of products. I was just having a discussion with hubby yesterday; my weakness is skincare/beauty and his is Nike shoes. I’m not sure which is worse for our wallet. Thanks for all your help. Love the blog! Great post! I’ve been a Smashbox Primer user for years because it erases my pores but this one sounds like it might be better for evening out complexion and helping with the overall health of your skin. Thanks for this detailed article! can I use cosrx BHA power liauid and LJH vita propolis ampoule in a same routine? I’m headed to Seoul in November… wondering if there’s a service that can help me work out a skin care routine of my own? THANK YOU! I’ve been scouring the internet looking for a “what order buying guide” and only come up with a “what order to apply guides”. This is very helpful! I’m building my routine around your reviews. so far so good. I used to use a mild BHA toner (Clinique) for my T zone and would like to switch to the Cosrx one and I would like to start using a AHA exfoliant. should I chose different products (Cosrx BHA Blackhead Power Liquid and The Ordinary Acid Ascorbic 8% + Alpha Arbutin 2%)??? correction : should I chose different products (Cosrx BHA Blackhead Power Liquid and an AHA solution) ??? Hi. 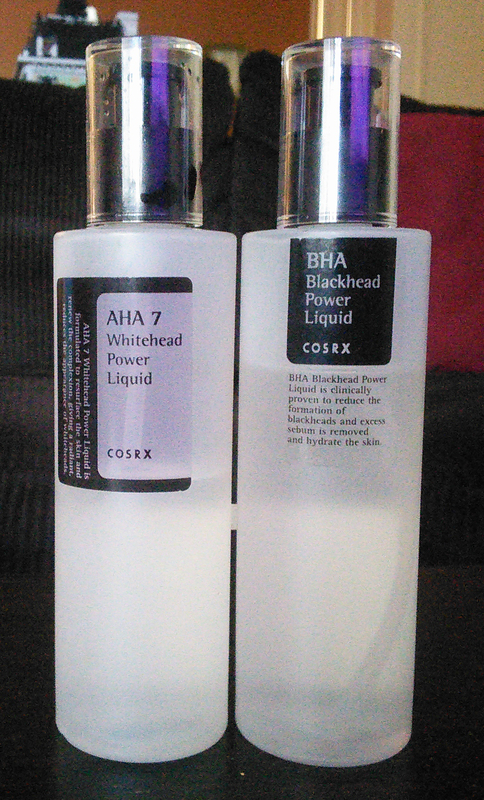 I really want to try the COSRX BHA blackhead power liquid as I have lots of clogged pores, few pimples and oily skin as I was stupid to use baking soda and witch hazel(I was having an allergic reaction to it apparently). But, I heard that the purging is pretty bad if you have lots of clogged pores and I get super embarrassed when I have pimples on my face as my breakouts are usually red and big. I only have about 6 weeks until holidays are over and I return to work. When does the purging stop? How do I reduce the effects of purging? I don’t want to go to work with pimples on my face. Hey, I’ve been a quite reader of your blog for over a year and I decided recently to dive into Korean skin care since I’ve been suffering from acne for over a YEAR. 2 years ago I had few glycolic acid (AHA) peels done and I had acne and scar free face for like 4 months. But then again I had bad breakouts once it stopped. 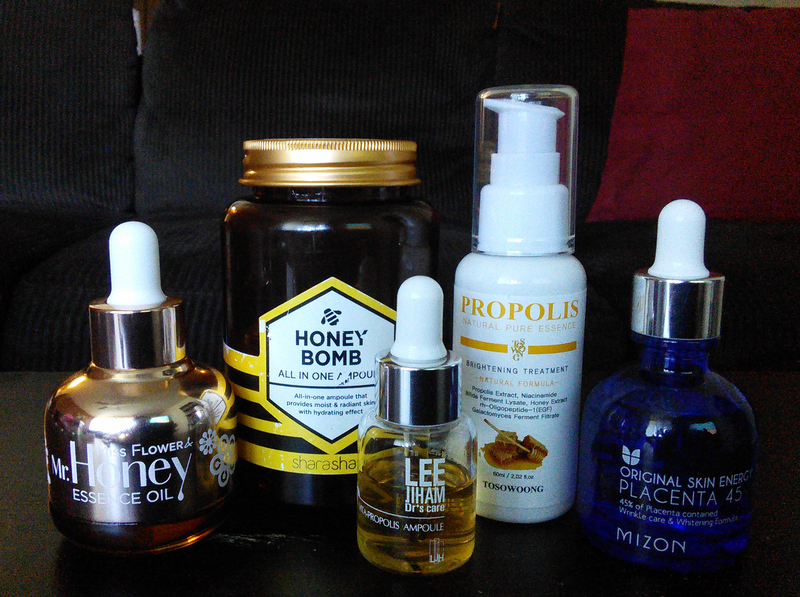 I do not want to waste more money for the peels which is why I decided on Korean skincare. I’ve been using the following products for my routine. I have combination-oily skin. Now it has been a month and 15 days and my breakouts have significantly reduced. But I still have red acne marks almost all over my face which do no seems to fade even a little. I don’t think they are PIE since I did test with the clear glass and the acne marks don’t fade. Mostly they are PIH. What am I missing in my routine here? Hi! Two things: You could use a vitamin C serum (I suggest Timeless or Tiam) and/or a niacinamide product (I suggest Holy Snails Shark Sauce, disclosure I work for Holy Snails but I’ve loved the Shark Sauce since long before then since she made it for me in the first place) to help fade the PIH. And how much sunscreen do you use at a time? My experience with the Neutrogena Ultra Sheer has been that it isn’t very pleasant when used in the correct amount needed to get the advertised sun protection. That Neutrogena cleanser is quite harsh which could be causing some inflammation and irritation that are making the marks stand out more, too. I agree with you about the neutrogena sunscreen I always end up using at lot and it does feel unpleasant. I’ll be switching to the innisfree one soon. I’ll definitely switch the cleanser and check. I have a clindomycin and nicotidamine gel at home which was earlier prescribed by the dermatologist, I guess that should work? About a month’s amount is left in that tube. Once that is over I’ll add in the Vitamin C or the Shark sauce. Im in the process of reworking my skincare routine and interested in adding: Sulwhasoo First Care Activating Serum EX and CosRX Advanced Snail 96 Mucin Power Essence in to the mix, but unsure as to when to use them. I am currently using CosRX A-sol then Vitamin c20. Will it be ok to use Sulwhasoo next followed by CosRx snail 96? Will I still need a serum after that or is it ok to use the Snail as serum and then onto night moisturiser? Thanks! Yep, that’s fine! And whether you need a serum after the snail just depends on if your skin seems to need more or not. hi there ive been into skin routine for weeks now n am planning to add dear klairs activating youth drop on my routine..am not sure as to when should i apply it over my routine..